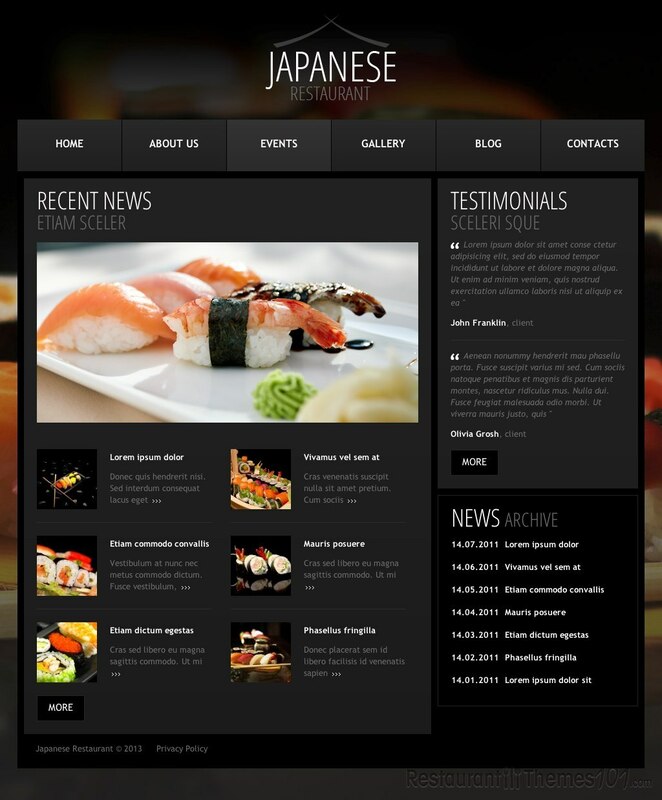 Japanese Restaurant is a WordPress sushi restaurant theme developed by Mercury and presented at Template Monster. 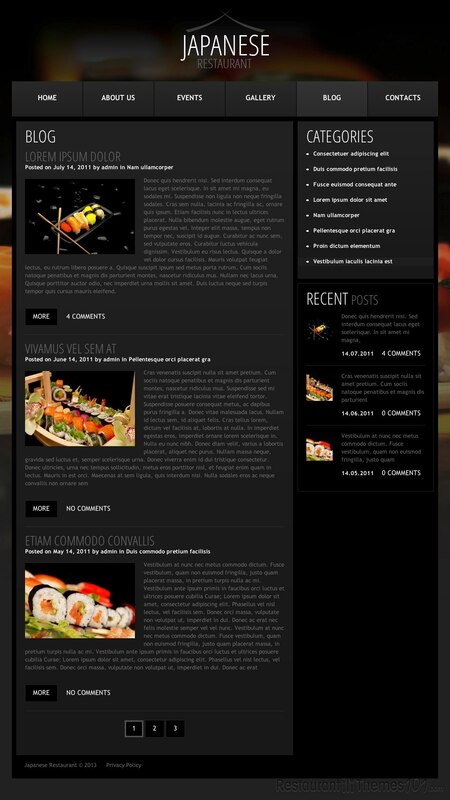 The theme has a very compact looking layout with a great set of colors chosen that put your content in the spotlight. 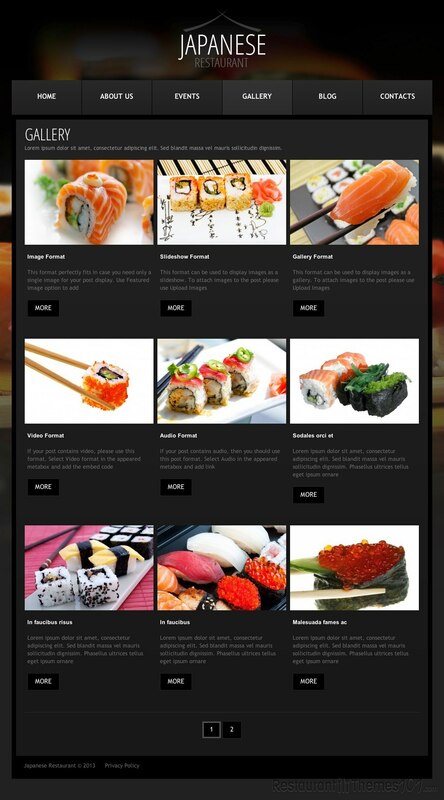 The homepage is enriched with a nice looking slider with big high resolution photos of your delicious dishes that will grab the attention of your visitors as soon as they lay eyes on your website. You will also have a big, high quality photo as a background, with fitting black boxes added where you can add your content. 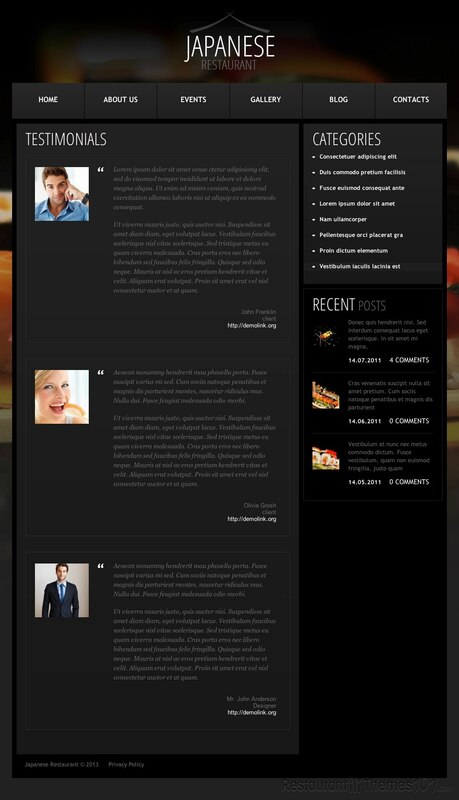 The “about us” section is reserved for your archive posts and testimonials from your satisfied customers. 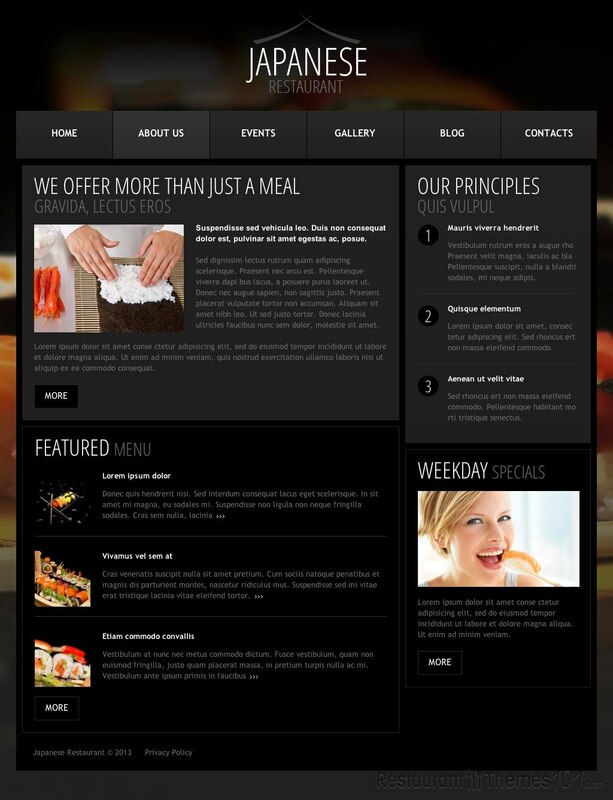 It is a nice way to show your visitors what your customers think of your restaurant. There is a separate events section where you can announce any future events with photos and detailed information about the event and present it to your visitors. 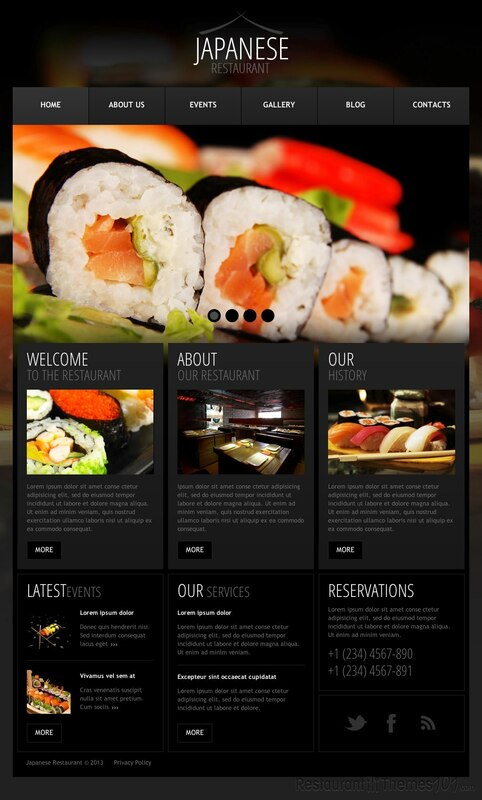 The theme has a blog section where you can add posts and introduce your visitors to any aspect of your restaurant you want them to be familiar with. The gallery area is a perfect place for creating posts with photos, and you have the possibility of choosing whether you want your photos shown in a slideshow style, a gallery format, a video format, an image format (if you want to add only 1 image to a post), or an audio format if your posts contain audio. 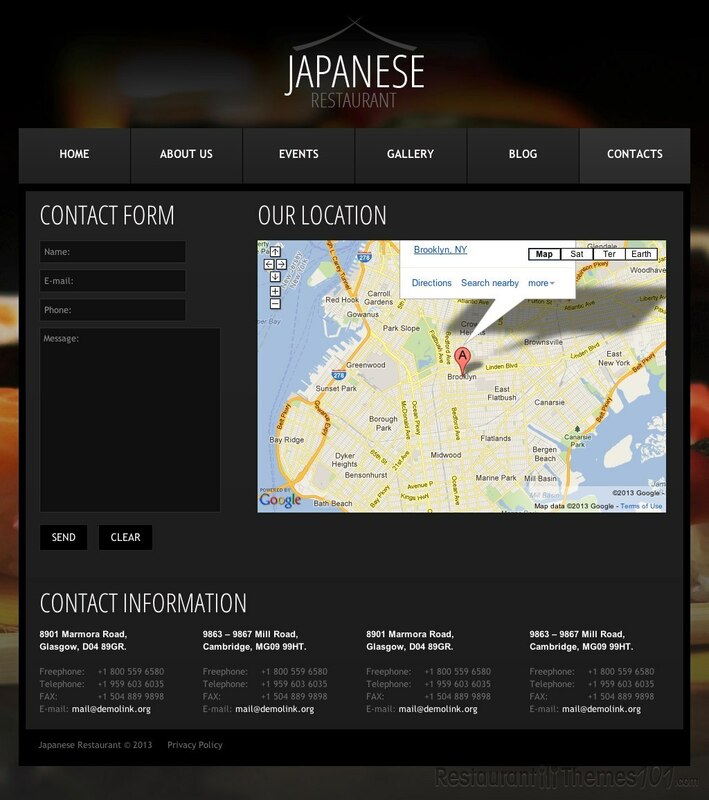 Japanese Restaurant features a great admin panel that will make managing the theme very easy. No need to be a professional to make this theme work. You will also get instructions on the installation and theme setup when you purchase the theme. There are several ways of purchasing this theme. Apart from the regular single theme purchase you will have the ability of ordering nice bundles that consist of the theme + installation + hosting, and many more.